Gold with moonspots; blue eyes. Paela - 3rd freshener, 3 yrs old. 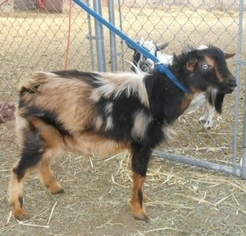 I always tell people that Paela is the best goat I own. She may not have a flashy pedigree, but don't let that fool you, this girl is all dairy. Paela's first freshening udder as a yearling was rather unimpressive. She had a single kid and and her capacity was very minimal; I even considered selling her (boy, I'm sure glad I didn't!). Paela had twin doe kids on her 2nd freshening and oh my, that udder! Paela's udder has turned into a thing of beauty: well attached, beautiful fore udder, good rear udder height and CAPACITY. The only thing I wish for is little better medial suspensory ligament, but that's if I'm being picky. She has impeccable milk stand manners and milks down really well. She has great "dairy ethics" and isn't the type of doe to hold back milk, she puts it all in the bucket. Paela's show record is quite impressive; she really catches a judge's eye! See below for her many show accomplishments. Paela finished her permanent champion title at 4 years old in June 2018. Paela has maintained a linear apprasial final score of 90 as a 2yr old, 3yr old, and 4yr old. As a 2nd freshener, Paela proved she is 100% dairy goat. 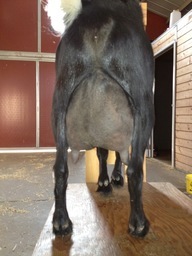 During her peak production (between 40 and 75+ days) she was producing between 4.5 and 4.3 lbs of milk. That is over 1/2 a gallon per day from this little girl! Paela qualified for her milk star in production, butterfat, and protein with only 206 DIM, 660 lbs milk, 40 lbs BF and 27 lbs Protein. Paela also earned her Superior Genetics award in August 2016 as a 2nd freshener and also earned a Sue Rucker JUJU Bronze certificate through ANDDA for her 2016 lactation! Paela was on track to repeat this in her 3rd lactation, but I decided to dry up the herd after the show season. Paela's twin daughters from 2016 are already making their mark in the show ring, as well. Seven Winds MB Belladonna VV++ 83 (FF score) is 1x GCH Jr, 1x Jr BDIS, and 1x RGCH Jr and Seven Winds MB Tinker Belle is 1x GCH Jr Doe, 1x Jr BDIS, and 1x RGCH Jr. ​Her 2017 doe kid, Seven Winds IM Love Story, was twice 2nd place in her Jr doe class at the MT State Fair (the only show I took her to) behind an older doe kid. 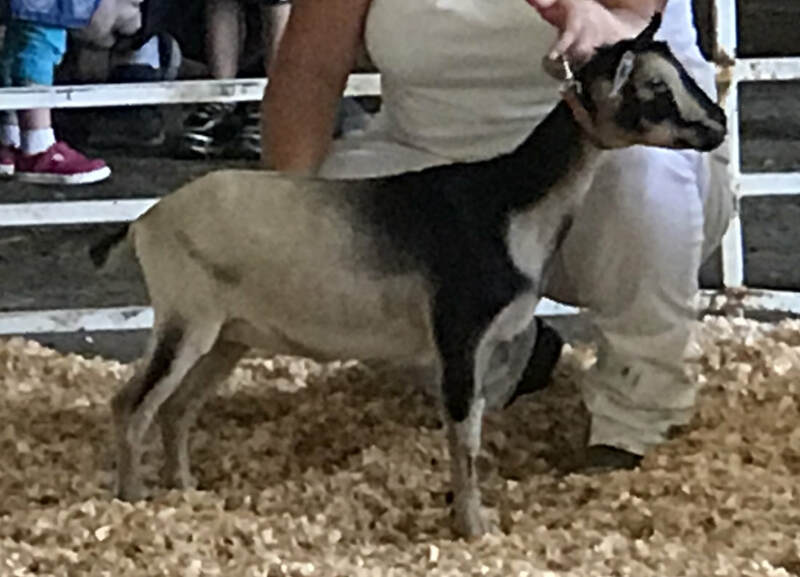 Her 2018 buck kid, Seven Winds NJ Midnight Hour was Champion Jr Buck at the Treasure State show at just over 2 months old. 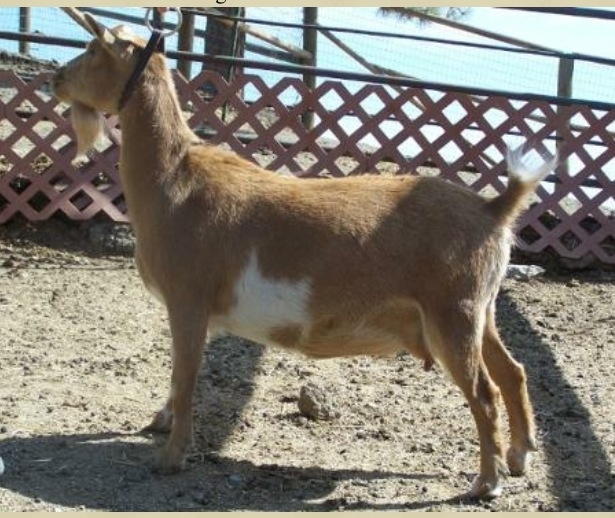 2x's 2nd place Yearling Milker at Musselshell Goat Association ADGA Show, Reed Point, MT on June 20,2015. 2x's 2nd place Yearling Milker at MT State Fair ADGA Show, Great Falls, MT on June 25-26, 2015. 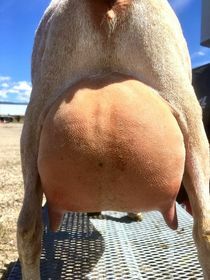 Best Udder in 2yr Old Milker Class, Ring 1 at the Central MT Dairy Goat Association Show. 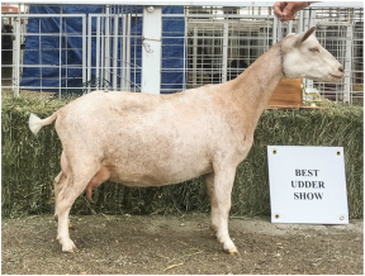 RGCH Sr. Doe at MT State Fair on July 31, 2016. Paela's Dam: Van Goght Jazz. Photo courtesy of Gabhran Creek Farms. Paela's Sire: Simply Eden Gallant Ethos. Photo courtesy of Gabhran Creek Farms. Paela's Sire's Dam: Prairie Wood Zena. Photo courtesy of Gabhran Creek Farms.